The first period on last night's meeting between the Blueshirts and the Ottawa Senators was solid hockey. Scottie Gomez scored the first goal half way through, and even though speed-demon Jason Spezza scored for Ottawa toward the end of the first period, it appeared our Rangers were tired of the embarrassment and ready to play after a humiliating game against the Minnesota Wild and the OT loss to the Avs all in the same week. Well, everything fell apart. After a strong first period, the Rangers seemed to magically lose energy, perhaps showing the effects of playing for the fifth time in eight days. Maybe Tom Renney gave them a few motivational tips during the intermission!!? In the end, the Rangers have won only two games in the last ten. Recap here. The second and third periods, Ottawa proceeded to score twice and shutdown the Garden chants. 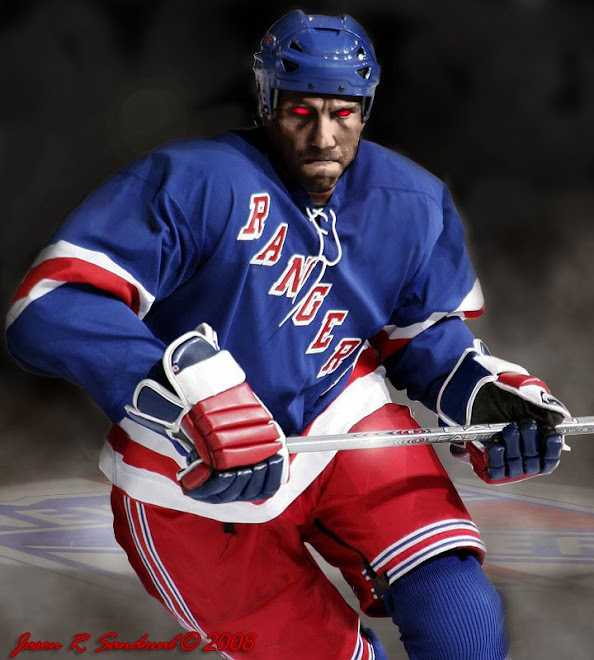 Senator's Shean Donovan moved up and around Ranger's Marc Staal, forced to dive on his stomach to deny Donovan's progress after his stick broke, and got a shot in on Blueshirt Henrik Lundqvist. The rebound popped out above the crease to Kelly, who shovelled in his seventh goal to make it 2-1 with 7:44 left in the second period. Ottawa's Mike Fisher made it 3-1 when his shot from the right point, after a turnover by New York's Chris Drury, hit Rangers defenceman Marc Staal and caromed in at 9:08 of the third period. Game over. Ryan Hollweg seemed to be the only player on the ice last night after the first period. He was appropriately forechecking, taking advantage of turnovers, shooting the puck, throwing himself into the goal.....gold stars to Ryan! First time I've ever said that, as I have never understood why Hollweg was essential to the team....until last night. Irony. So with that Ranger's fans, I do think things will turn around in the New Year. 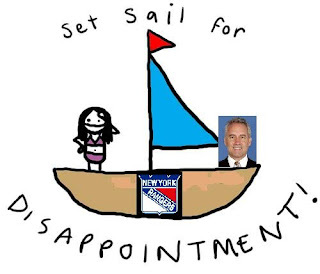 One of my New Year's resolutions is for the New York Rangers to start winning games again - and I do believe Tom Renney will not hold a place on this team after February - 'the shake up is near' because things are not getting better. Happy holidays to all and happy hockey to all! 2) Maybe one perspective would be to see where your team was last year at this time and compare? If memory recalls they were struggling until about the all star break and then put it all together. 3) On paper at least this team is very capable of doing that once again, and once you get into the post season its usually the team with the hot goalie that wins.